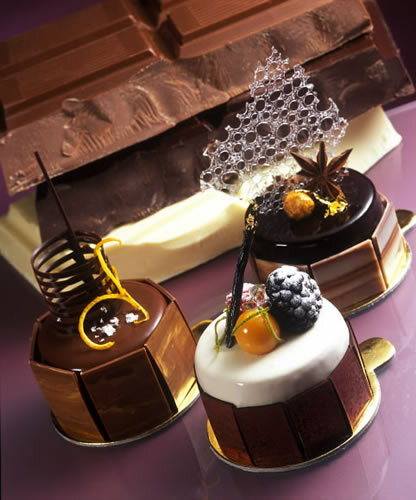 Melt the covering, combine the hazelnut paste, blend and finish with small puff-pastries and cocoa bean crumbles. Combine the three ingredients and mix. Bring the milk to 60°C, combine the Sarbav and mix. Put the Ovoplus, the semi-melted chocolate and blend. Pour the whole mixture on the semi-whipped cream. Bring the milk to 60°C, combine the Sarbav and mix. Put the Ovoplus, the flavored paste and blend. Pour the whole mixture over the semi-whipped cream. Put on the bottom of the monoportion biscuit or chocolate sponge cake, the crunchy and then press down and cool. 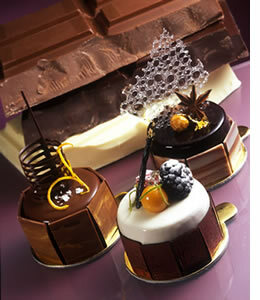 Sarbav is a stabilizer for Bavarian desserts, that maintains their structure soft and creamy. The selection of gelatine that composes it allows for a quick and simple making of the sweet, so that it doesn’t thicken quickly. Ovoplus is composed by pasteurized and 50%-sweetened egg yolks, with a high whipping power. SugarPlus is an innovative product similar to Isomalto but with a higher hygroscopic power, more brilliance and clearness.